MMS JULY 2018 64 mmsonline.com CUTTING TOOLS Tips for Thread Milling Tricky Materials Compared to tapping, thread-milling technology offers advantages for creating threads in challenging materials, such as tool steel, stainless steel and high-temperature alloys. Here are a few tips for establishing an effective thread-milling process in those materials. Thread milling is becoming more popular for a few reasons, says Jamie Rosenberger, threading tool product manager for Allied Machine and Engineering, manufacturer of holemaking and finishing tools. For one, she says, most new CNC machine tools now offer helical interpolation as a standard feature. (This simultaneous XYZ motion of a spinning thread mill into a part's hole is required to enable the tool, which has a body diameter that is only a fraction of the hole diameter, to cut the threads.) 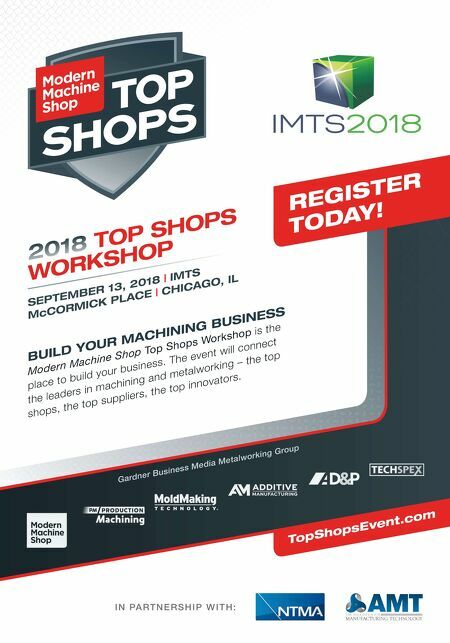 Therefore, new machinists and programmers who have "cut their teeth" on this type of newer machine tool tech- nology seemingly are more open to considering thread milling as a viable alternative to traditional tapping operations. In addition, Ms. Rosenberger says thread mill- ing is particularly well-suited for challenging, expensive materials, such as tool steel, stainless steel and high-temperature alloys. 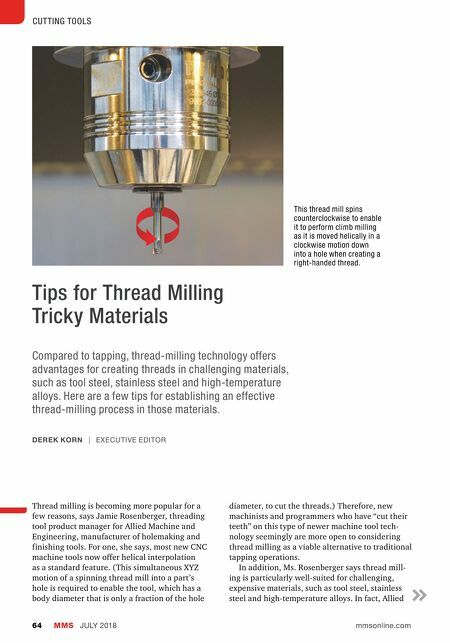 In fact, Allied DEREK KORN | EXECUTIVE EDITOR This thread mill spins counterclockwise to enable it to perform climb milling as it is moved helically in a clockwise motion down into a hole when creating a right-handed thread.